Are we drowning in S-Chassis yet?… I know, I know… too much of a good thing isn’t always best is it! 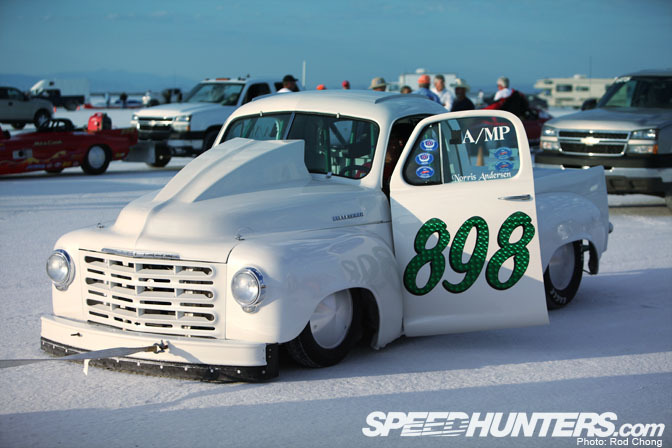 Oh well… To break up the monotony I present to you a pickup truck! 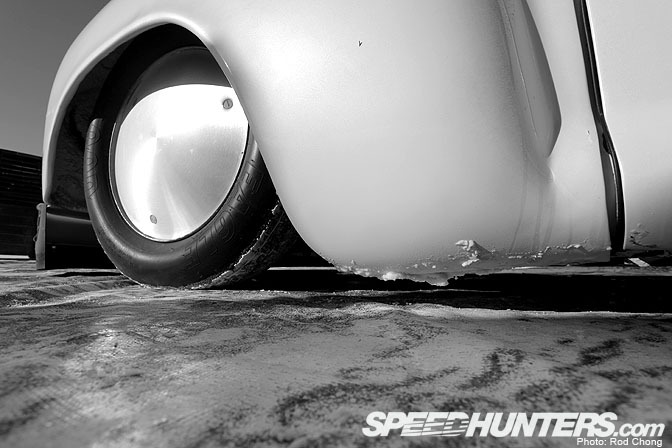 To the surprise of a few of the Speedhunters audience, I snuck the above image into the original announcement of the 2009 Speedhunters awards as a great example of stance. Some of you were confused that I wasn’t showing a stretch-tire-special, but I think this machine is a great example of perfect stance … look at the rake! There’s a serious lack of ground clearance happening here. This truck’s stance though is not a statement of fashion over form. It’s purely a question of aerodynamic efficiency and stability at speed. The plastic air dam has less than 1 inch of clearance to minimize the amount of air getting under the truck. 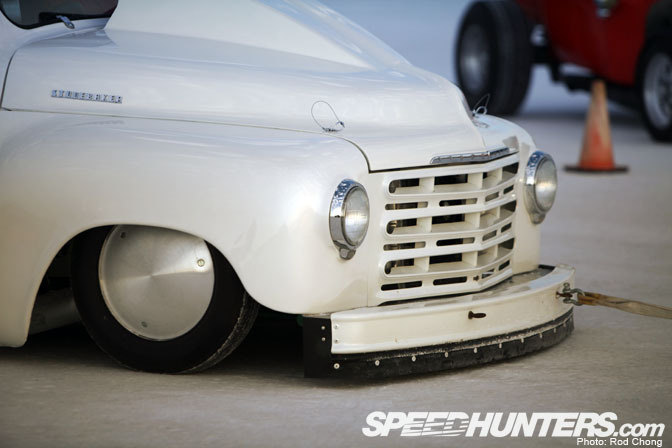 At Bonneville, even millimeter variations in a car’s ride height and rake can have a huge effect on stability and top speed so you can bet the ride height has been tuned with utmost care. 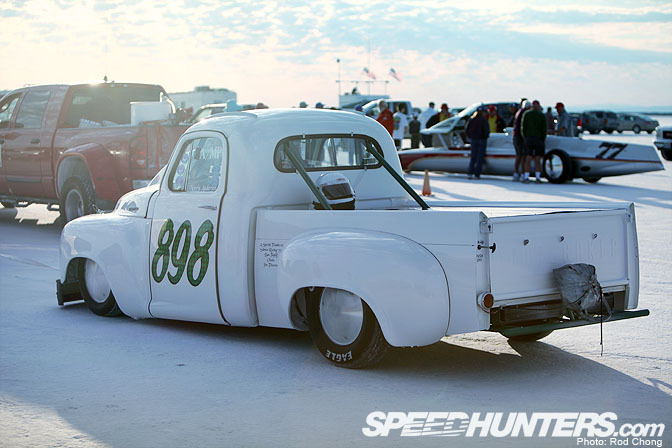 It’s hard to imagine this 1949 Studebaker pickup was salvaged from a Nebraska wrecking yard in 2004. 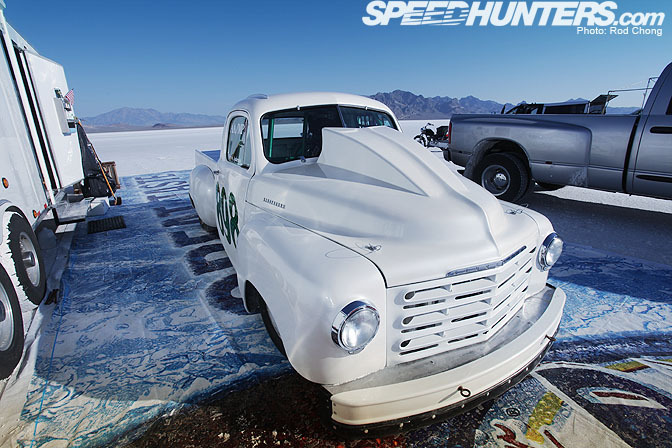 It’s since undergone a ground up restoration and transformation into a pure bred Bonneville racer. The owner/driver Norris Andersen is an ex-air force technician with a history of building Sprint cars. You can tell he’s absolutely meticulous in his approach. 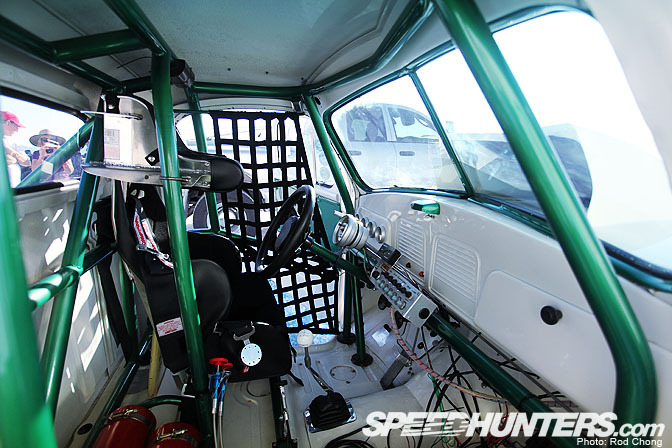 The green roll cage sets off nicely against the white pearl paint. Eager to get a closer look at the truck, I later found it along the miles and miles of pit area that stretch out across the salt lake. This is the first shaved engine bay I’ve ever seen on a race car! Pure class. The engine is a monstrous 565 cubic inch big block Chevy. 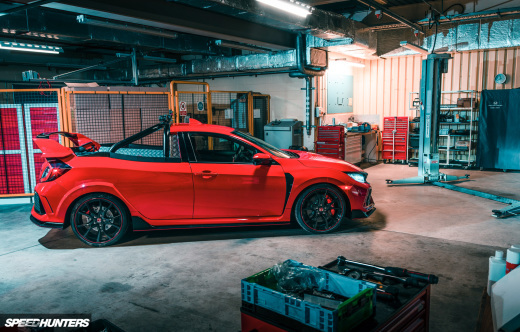 It converts to a staggering 9.3L displacement! 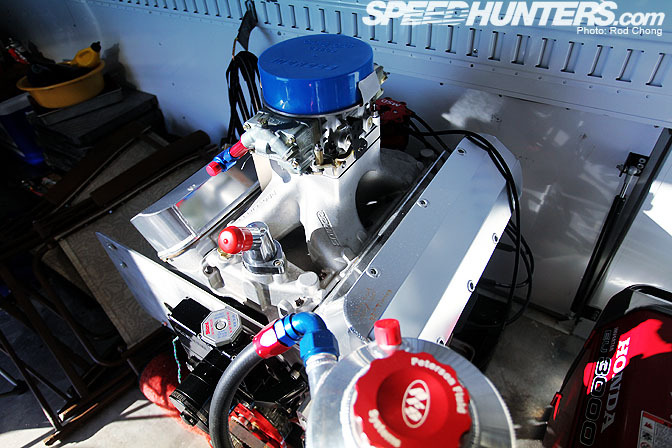 Ack!… The natually aspirated motor develops 963 hp @ 7500 rpm with 760 lb-ft @ 5800 rpm. 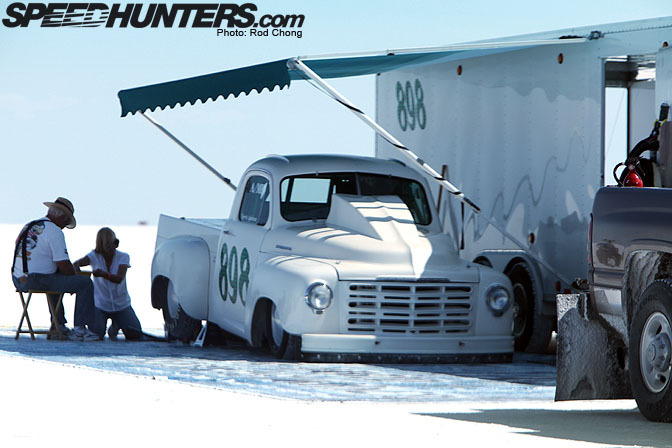 Imagine trying to launch that on the loose salt surface! Norris took me inside his trailer to show me this second powerplant. The slightly smaller 477 ci engine outputs 820 hp @ 7500 rpm and 610 lb-ft at 5600 rpm. This allows Norris to run in both the A/Modified Pickup and AA/Modified Pickup classes. Both engines mount using the same plates and all connnectors are quick release. 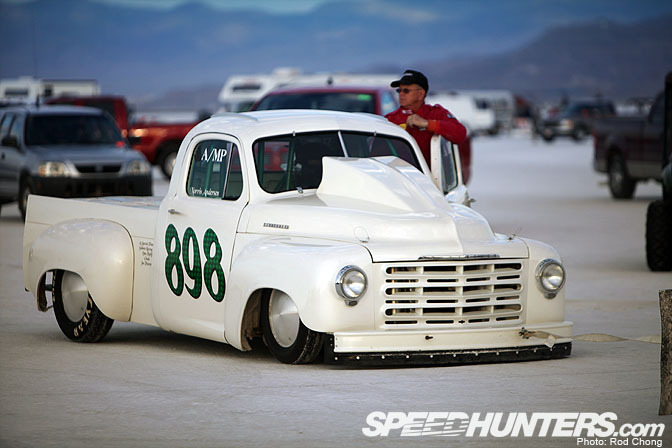 This allows for quick engine swaps half way through the week long Bonneville competition. … He set a new record in the A/MP class with a speed of 191.966 mph… a whopping 40 mph faster than the previous record! 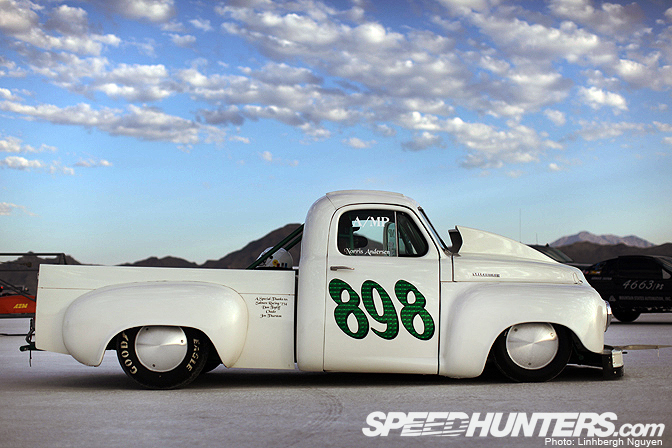 Not only is this truck a beautiful build, but it has the performance capabilities to back up its good looks. 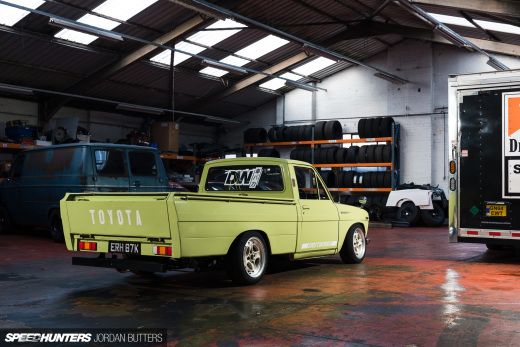 It’s a perfect example of the Misfit builds we are showcasing this month. 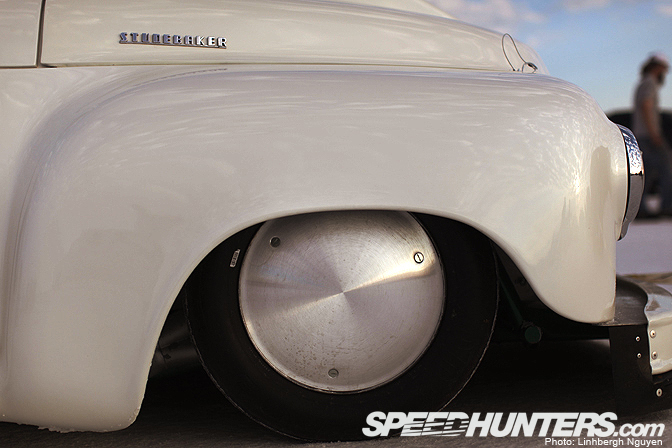 As a studebaker owner, i love it! Great feature! "The owner/driver Norris Andersen is an ex-air force technician with a history of building Sprint cars. You can tell he's absolutely meticulous in his approach." ...so meticulous yet so many wires and cables hanging under the dash? Right. That caption should have been for his engine bay- very clean in there! Old school truck with massive power....its a thing of beauty. Aweome! Salt Racers are win! That stude is wicked! Love the stance in front. o0o is that (2) essarr twentie in that their hood i see? 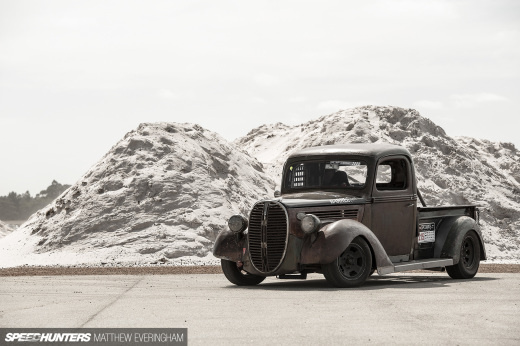 I'll have to pick up the issue of HotRod with this in it!